Idaho may not be the most popular—or populous—state in the Union, but it’s certainly one of the most breathtaking. Numerous lakes, several rivers, and magnificent mountain vistas make Idaho a real stunner. Solar power can be an important factor in maintaining the state’s health and natural good looks. This northern territory borders on Canada, but Pacific Ocean air keeps winter temperatures higher than might be expected. In fact, the relatively mild weather is what gave Sun Valley its name. Summers in Idaho can be quite hot and provide plenty of solar energy. Is it worth it to invest solar panels in Idaho? 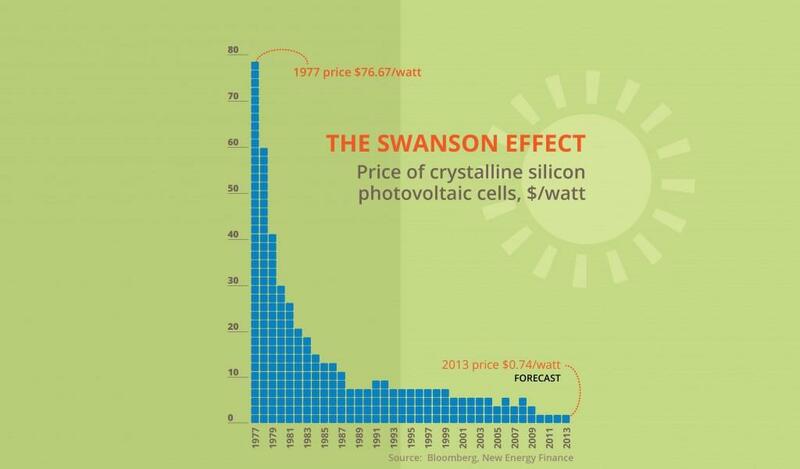 If you look at the Swanson Effect graph below, you can see that solar energy costs per watt have dropped dramatically since 1977. As new technology continues to emerge, the price will go down even more. But how does this information relate specifically to the “Gem State” and the “Potato State”? 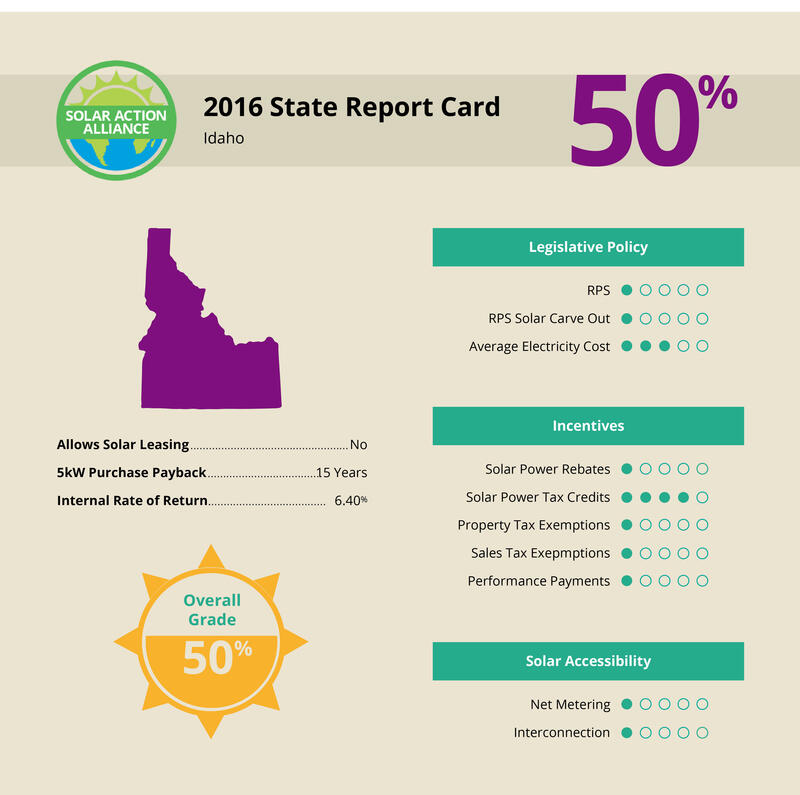 Should Idaho be called the “Solar Panel State” too? Let’s find out! The graph above shows the returns on a 25-year investment in solar power in Idaho. It’s clear that if you wish to make a significant amount of money in the end, a cash purchase is your best option. That’s because electricity rates in Idaho are some of the lowest in the country, so loan interest outweighs the difference between solar and standard electricity. Of course, you’ll notice that an outright purchase requires a great deal of money up front, and it still takes about 15 years to see any returns. 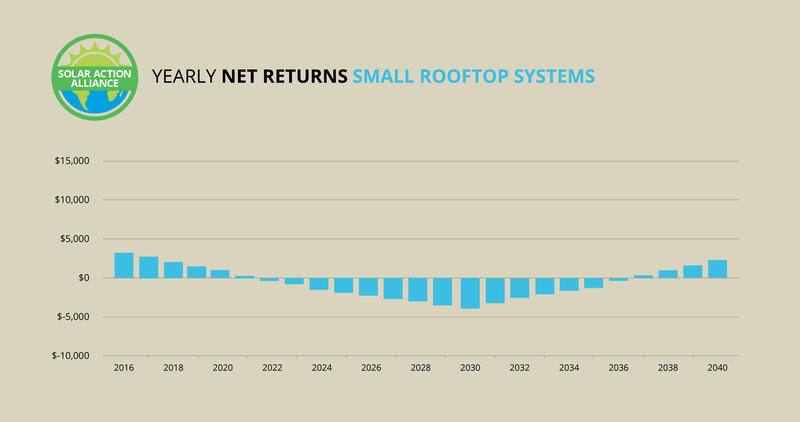 If you have less cash in the bank, installing a small rooftop system is a viable option. If you qualify for a loan or HELOC, you can get a more extensive solar panel energy system with no money down. With these last two options, you’ll get some initial tax credits for your installation. 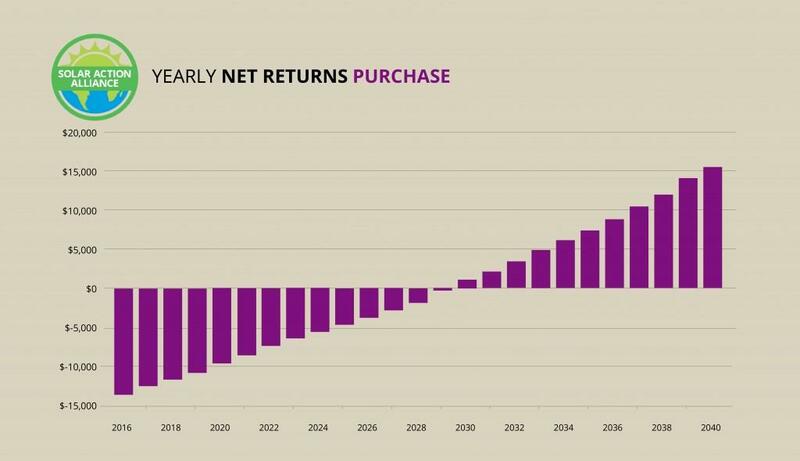 Unfortunately, after about five years, you’ll actually be spending more money for quite some time. You can find out more about each of these three options by reading the breakdowns below. If you live in Idaho, want to convert to solar energy, and have cash on hand, there’s no doubt that buying a system is the most sensible option. When you own your system outright, you’ll earn a substantial tax credit from the federal government, a deduction on your state taxes, and start seeing savings immediately. Let’s say your solar panels and system cost you over $20,000. The first year, and each year thereafter, you’ll steadily earn that money back. Within less than 15 years, the system will have paid for itself, and you’ll actually start to generate money. When all is said and done, by Year 25, you’ll have recouped your initial investment and earned more than 75 percent again! 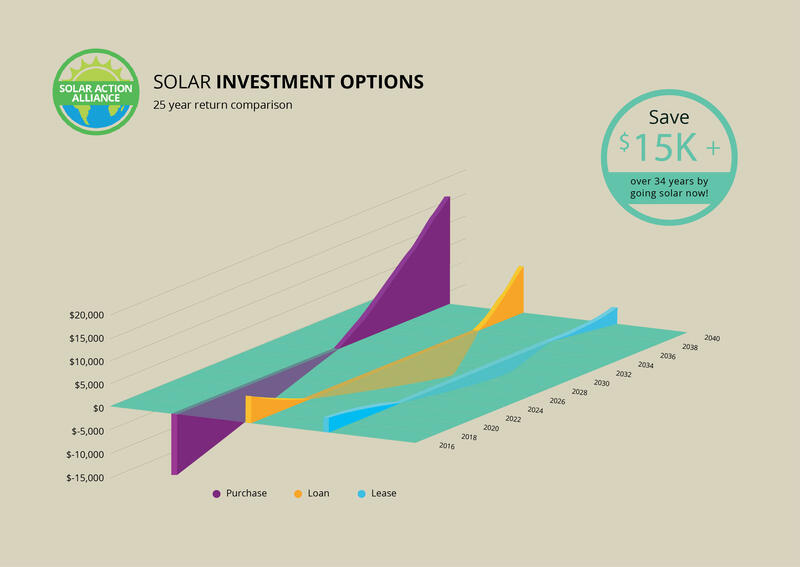 Usually, buying a solar energy system with loan funds is a smart option. In most states, solar panels generate income for their owners, because the comparative costs of traditional grid electricity are so high. In Idaho, the differences in cost between conventional and solar power are minimal, because conventional power is so affordable. 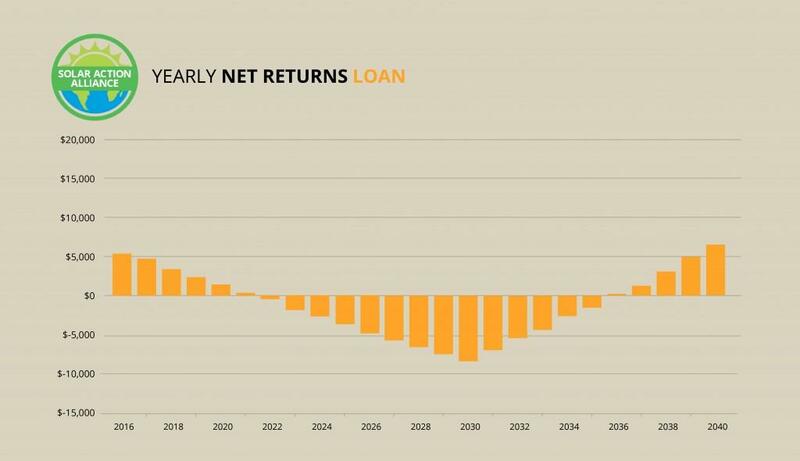 If you look at the chart above, you’ll notice that when you install solar with money from a 15-year loan, you’ll start out with a bang. That’s because the federal government issues you a tax credit for 30 percent of the total installation cost. For the remaining life of the loan, however, your spending outweighs your savings. But don’t despair! Once you’ve paid that loan off, you’ll start generating income, and your investment will pay off. With no money down, you will have made over $6,000 by doing essentially nothing—except helping the environment! So if you qualify for a HELOC or other loan of at least $20,000 to cover the solar-panel installation, and you can get a good interest rate fixed at 5 percent or less, the loan option is a good one. Even if you don’t have enough money to pay for a full solar energy system, you may very well be able to afford solar panels. And it’s worth it! Because electricity costs are so low in Idaho—almost the least expensive in the United States—making loan payments to pay for a solar energy system is not much cheaper than just paying for good old electricity. But if you’re interested in solar for any reason other than financial gain—such as ethical or ecological beliefs—then it’s still worth it to harness sun power. Installing a small system is an affordable way to do it. As with a loan for a full-fledged system, you’ll get a 30 percent tax credit right off the bat and then spend the next 15 years or so paying extra costs for your system. For the next 10 years, you’ll be earning money. You’ll end up making a couple of thousand dollars of passive income over the long haul. 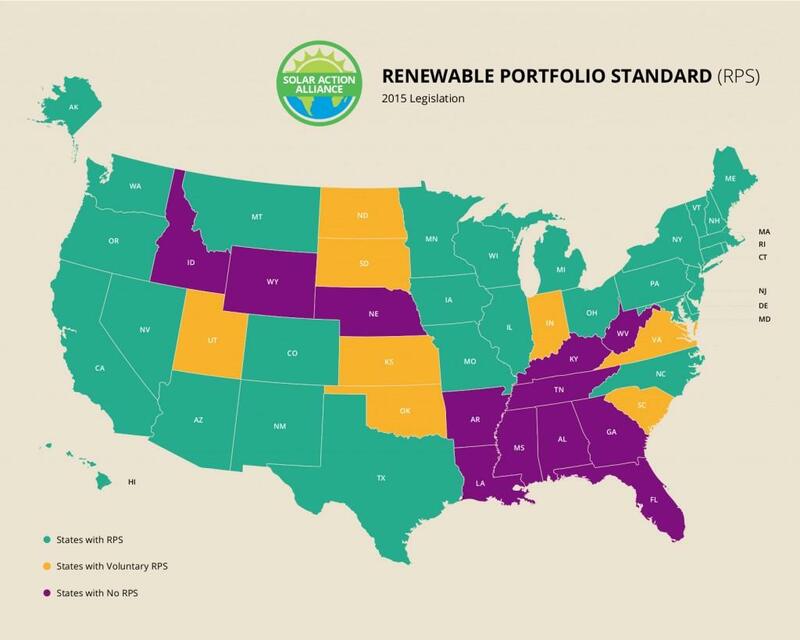 Solar power accessibility has less to do with a state’s weather and more to do with the rules set up by the state itself and utility commissions. In Idaho, there’s plenty of sunshine, but there are no laws to encourage the harnessing of its power. Essentially, utility companies in this state have no compelling reason to generate renewable energy or encourage homeowners to do so. That’s why, although converting to solar panel power is always the right thing to do for the environment, it doesn’t put a whole lot of cash back in Idahoans’ wallets—at least not currently. One thing Idaho has going for it when it comes to solar energy is its relatively high solar tax credits from the state. Unfortunately, the excitement ends there. The bottom line is that Idaho has little to offer its residents in terms of incentives for conversion to solar power. In fact, Idaho is distinctly solar-unfriendly. So if going solar appeals to you, it’s important to understand that the main reason to do so is to lead by example. Compared with other states, your returns will be small potatoes.